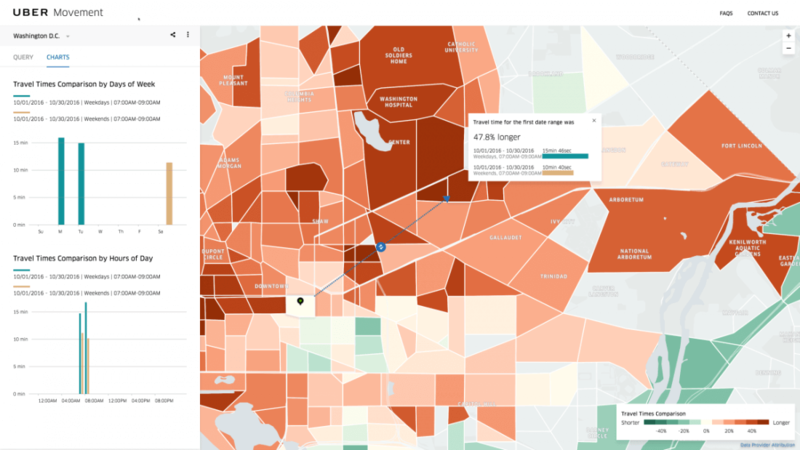 With more than two billion rides logged in 450 cities around the world, Uber sits on a treasure trove of traffic data, and it’s opening up some of it in anonymized form so cities can look into ways of improving urban mobility. The ride-hailing firm has historically been reluctant to share its data with governments, and it’s still fighting some requests to share more granular data with them. The latest move is a concession of sorts that could help it soften its image with regulators and city officials. The new tool, dubbed Uber Movement, is rolling out with traffic information for three cities: Manila, Sydney and Washington. The company hopes to add dozens of cities before the site is made publicly available in February and it will eventually contain data for every city in which Uber is active. The data is broken down into zones and neighborhoods so users can check the historical time it takes to travel between point A to B at a certain time and day of the week. Uber Movement doesn't provide details on individual trips, vehicles or passengers. The company is currently lobbying against rule changes proposed by New York City officials requiring all dispatches to provide the address and time for each pickup and drop off. The city says the information will enable it to determine whether drivers are working too many hours or illegally taking fares at restricted locations (like certain airports), but Uber has argued this would present an invasion of riders’ privacy.